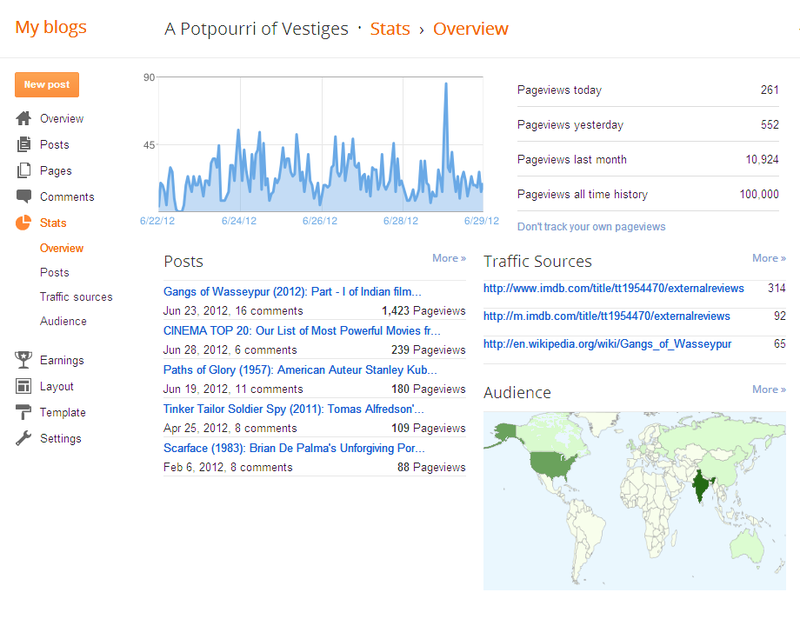 It gives us immense pleasure to announce that today A Potpourri of Vestiges has hit the 100K mark. We would like to start by thanking the Almighty. We would also like to extend are sincerest gratitude to our ardent readers who have been instrumental in making us reach this far. What had started out as a mere means of self-indulgence has today blossomed in something significantly promising. A Potpourri of Vestiges has finally started to fulfill its true purpose, that of serving International Cinema. Today, we are fortunate to get zealous readers from all the nooks and corners of the globe who, like us, are keen to fathom the depths of Cinema, layer by layer. As we continue our amazing journey, we would like to thank all those who have helped made it a reality. In the days to come we look forward to a much more enthusiastic participation from our readers as we plan to come up with many more interactive features on our blog. Congrats Murtaza and A Potpurri of Vestiges on this landmark achievement !! Keep up the good Work, Mate !! Congrats! 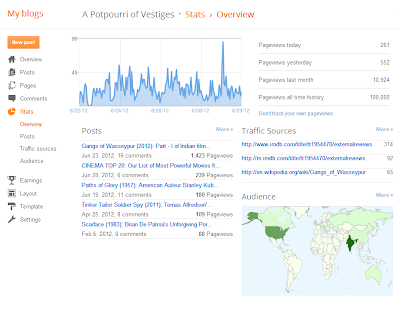 That is a very impressive count, considering both how young this blog is, and the relatively small amount of posts. Keep up the great work! Congratulations, don't thank the almighty but the humble visitor who comes to the site. Well done on the achievement. Congrats, Buddy!!!! You totally deserve this milestone--worth every hit! Big congrats! I know how much effort it takes to draw a lot of readers to your blog, and I know how much it means when we get the feedback from them with a great number of visits!